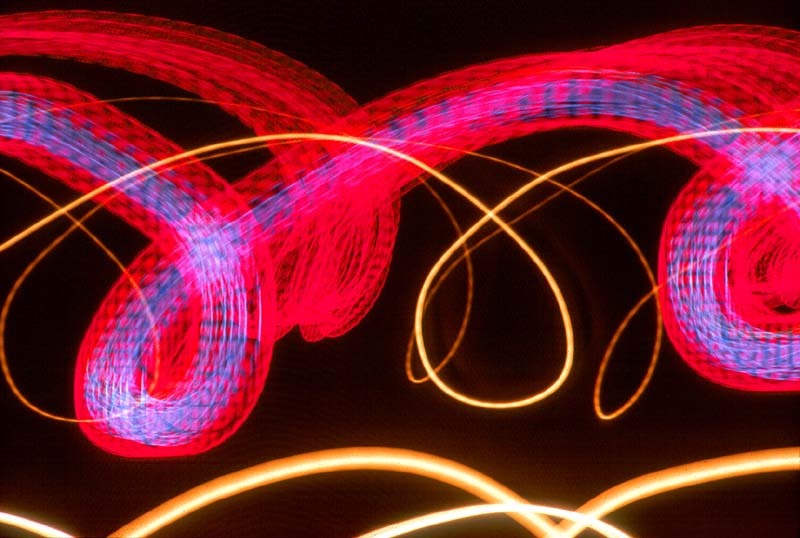 Back when I was an undergrad at UC Berkeley, I took a couple of photograhpy courses. One was an abstract photo course and one of our assignments was to photograph movement. This is a neon sign somewhere in San Francisco. I used a 35mm SLR Pentax camera loaded with Fujichrome, and moved the camera with the shutter open to capture this image that I think conveys movement. What do you think? 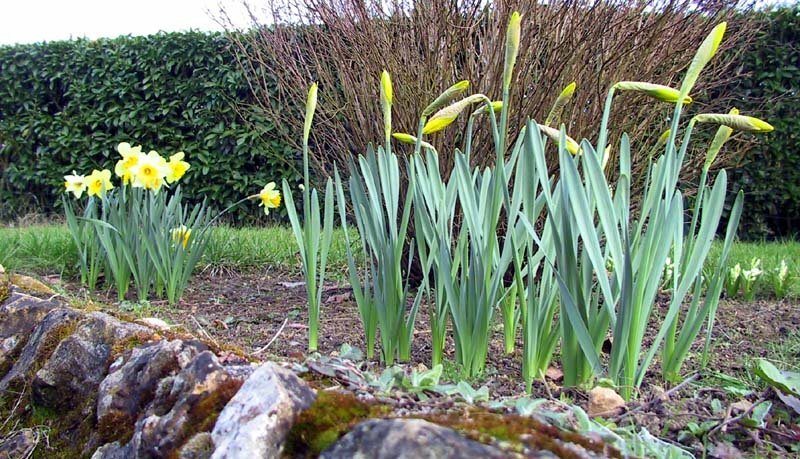 I transplanted these daffs from another location last year. This year, they've popped up very nicely. In years to come they'll fill in and be gorgeous! A close-up of the daffodils - jonquilles in French. And these are primroses that grow wild in the yard - primevères in French. 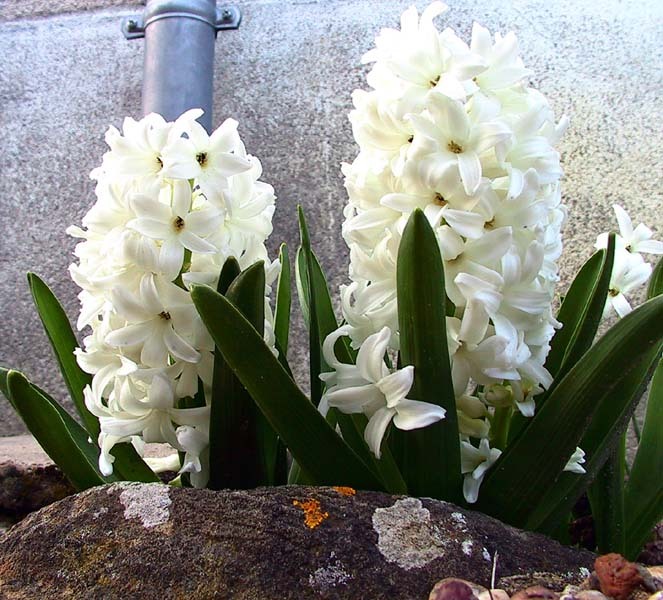 More hyacinths, this time white ones. 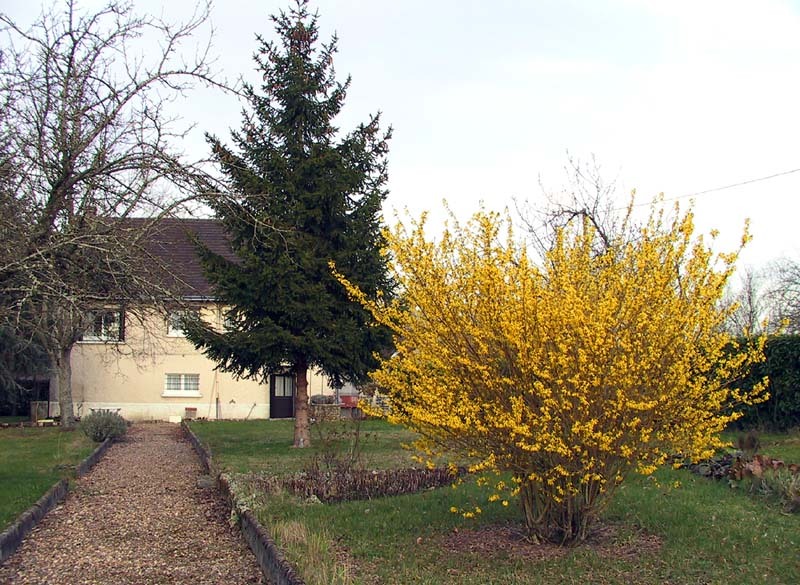 A forsythia in the yard, with the back of the house in the background. Last weekend, on our travels with visiting friends, we found the Château de Valmer. This wine producing château is just outside of Vouvray and produces the full range of chenin blancs that are common in that A.O.C. - sparkling, dry, and sweet. 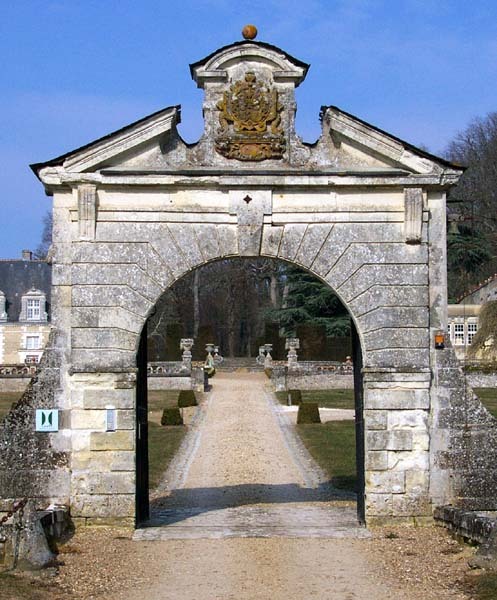 The entrance to the Château de Valmer. The brochure says that Valmer is renowned for its terraced gardens, including a kitchen garden that strives to conserve rare vegetable varieties. They were closed until April 1, and we'll wait until closer to summer to go back and explore them - not to mention to taste the wine! 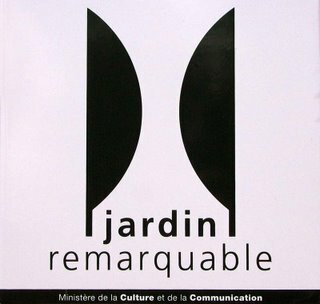 This small sign near the entrance marks Valmer as the site of a "remarkable," or noteworthy, garden as classified by the French Ministry of Culture and Communication. 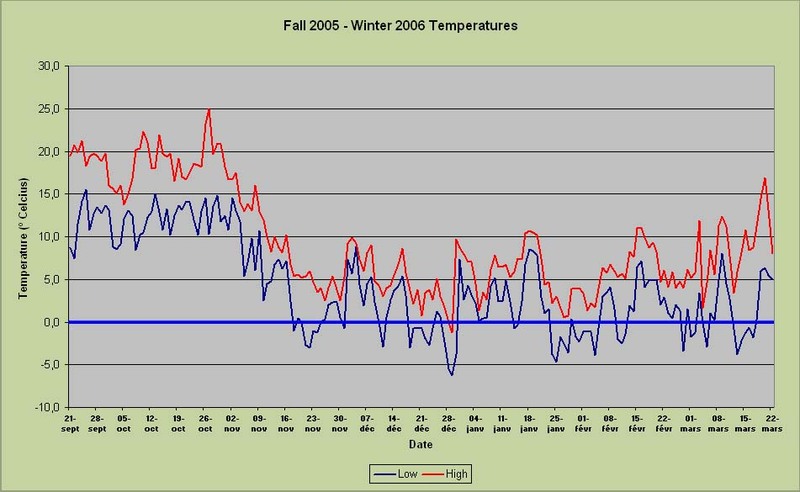 Since I've been talking about the weather here lately, I thought I'd share the chart below. We've been tracking temperatures outside the house for over a year now. 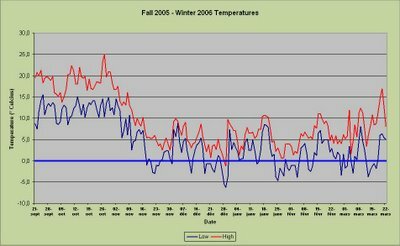 The chart shows our daily highs and lows since the beginning of fall 2005 up until spring 2006. It's in celcius, so remember that 0ºC = 32ºF, 10ºC is about 50ºF, and 20ºC is just below 70ºF. Temperatures plunged in November, but as you can see, it hasn't been all that cold, with daily highs mostly above freezing. That hasn't stopped us all from complaining about it anyway. The garden of Diane de Poitiers at Chenonceau, seen through one of the castle's windows. As I mentioned before, it was raining. At times it was coming down pretty good - so the exterior shots are mostly grey and colorless. But, that's how it looks around these parts in winter, er... early spring. Still, flowers are beginning to burst out all over, and trees are loaded with buds. A few good sunny days and we'll forget all about this long, cold winter we've had. By the way, everyone in our part of the country is complaining about how long and cold the winter has been. Mind you, by northeastern USA standards, this winter was a picnic. But not by Loire Valley standards. 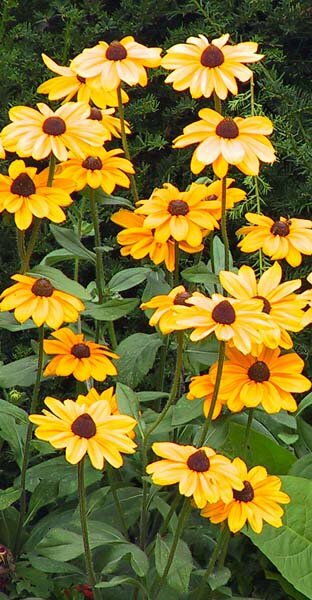 They seem to be used to mild winters, tempered by the warm Atlantic (thanks to the Gulf Stream). What's interesting is that whenever you talk about the weather, the conversation can leave you feeling like you don't understand a) the weather, b) the language, c) the people, or d) all of the above. 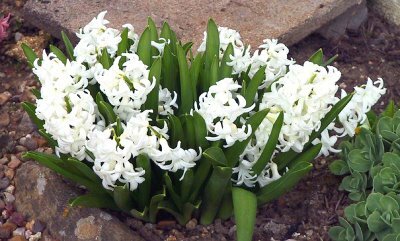 If you tell somebody you think it's mild, they are likely to respond that it hasn't been cold enough (to kill the insects). If you say you think it's been cold, they say that it's too cold and that's not normal. If you complain about the rain, they will say it's been too dry and we need the rain (which is very true). If you praise the rain, they'll say it's too dark and grey and depressing (which is also true) and that there hasn't been enough sun. Maybe this is just the French way of conversation. My friend Cheryl remembers that when she said to someone, "Il fait froid (it's cold)," she would get the response, "Oui, il fait pas chaud (yes, it's not warm)." If she said to the next person, "It's not warm," the response would invariably be, "Yes, it's cold." 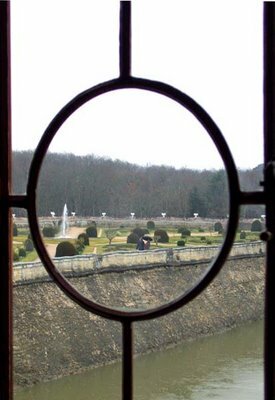 One thing can be said about visiting perhaps one of the most famous Loire Valley chateaux on a rainy March day: there are many fewer visitors than usual. 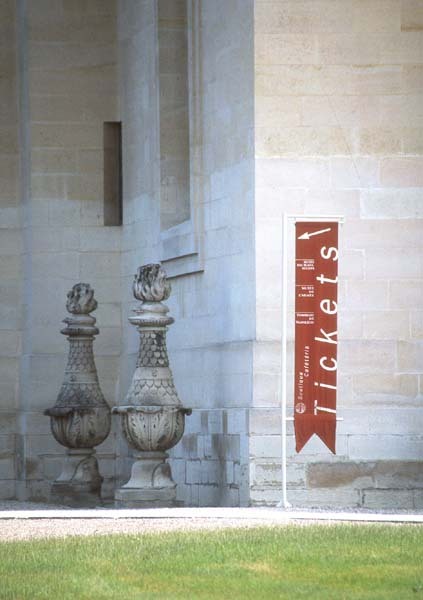 I have been at Chenonceau when the crowds were so thick you'd swear you were... well, you'd just swear. Yesterday, just a little rain, just a little after lunch, and we very nearly had the place to ourselves. Below is the main floor of the gallery that spans the Cher river. What's unusual about this picture, you might ask? Well, there's not a single person in the gallery. Most of us tourists never get to see it this way, except in official photos. The story of Chenonceau is complex, but the bit of historical intrigue that most of us are familiar with involves Henri II, king of France, his wife, Catherine de Médicis, and his mistress, Diane de Poitiers. The king had inherited the place (his father, François I, obtained it as payment of taxes due) and made a gift of it to his mistress, Diane, when he ascended to the throne in 1547. While she was in residence, she had the elegant bridge built from the castle on the right bank across the Cher to the left bank. In 1559, Henri II was killed in a jousting tournament. His wife, Catherine, now regent (Henri's son, François II, became king - he married Mary Stuart, Queen of Scots), forced her rival Diane out and took the castle for herself. 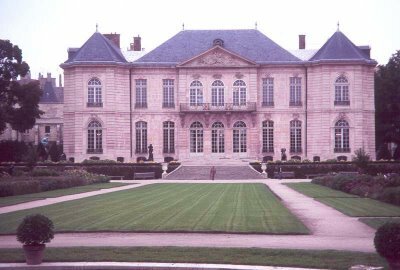 Diane was given Chaumont, but apparently never lived there. 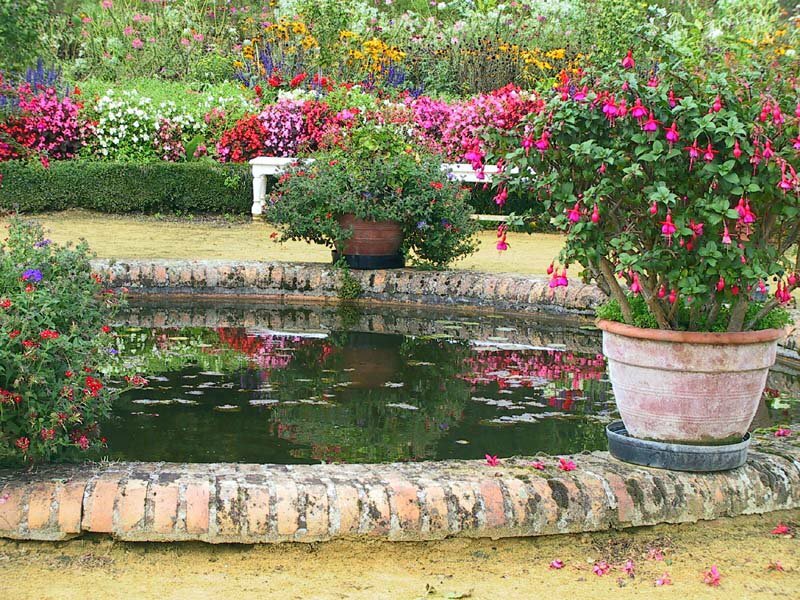 Catherine had a new garden built and extended and improved the parkland around the castle. She also is credited with building the 3-story gallery on the bridge across the river. Jump ahead a few centuries. In WWI the castle served as a military hospital. 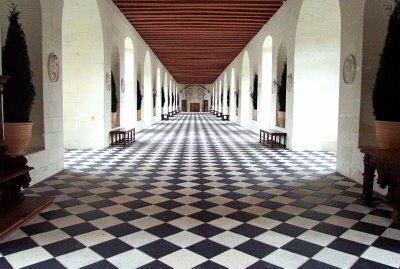 During WWII, Chenonceau was important for it's strategic location: the Cher river divided Occupied France to the north and Free France to the south. The castle was a bridge between the two. It's an impressive place. My favorite part is the elaborate kitchen complex in the foundations of the main castle. 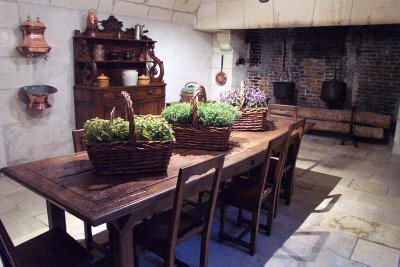 Servants' dining room in the kitchen complex at Chenonceau. 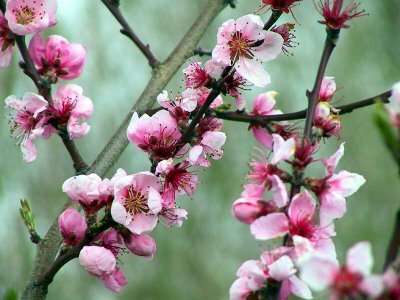 The first full day of Spring is finally here. Whew. For the next six months, we'll have more daylight than darkness, and the days are already beginning to get warmer. Sunday we visited the Château de Chaumont, among others, which overlooks the Loire river. From certain angles it looks like a perfect fairy-tale castle. It's even got a working drawbridge, although there's no moat. 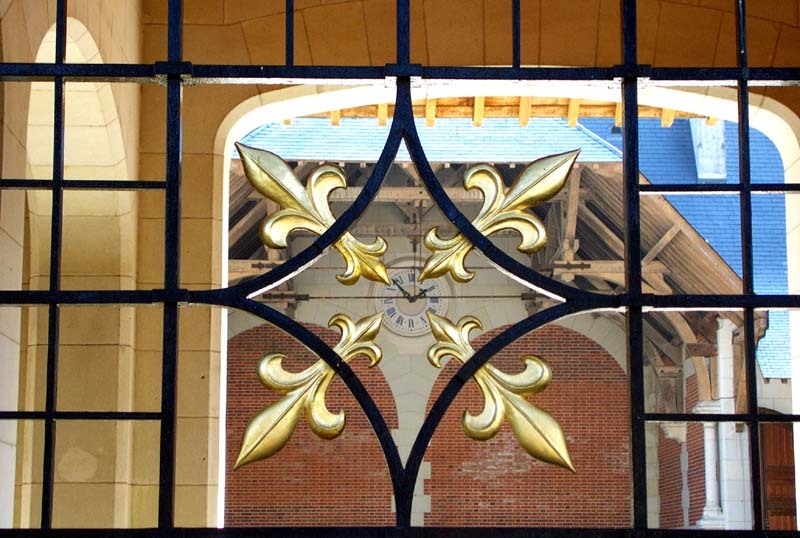 This is a view into the stable buildings through the gate - the stables were closed this day. We'll visit them one day, I'm sure. The rest of the day included a leisurely drive along the river, a stop for coffee, visiting a wine producer in Vouvray, and a quick look at the cathedral in Tours. We picked up Susan's husband Ray at the train station, enjoyed a dinner of steak and frites, then headed home. 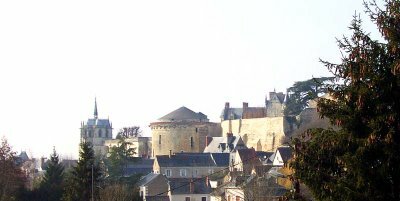 Not the typical postcard views of the Château d'Amboise. Above, imposing gargoyles lean out from the castle's free-standing chapel high above the street in the town below, as if they are watching to be sure no one gets out of line. Today, we walked from the river (la Loire) up to the Clos Lucé, which was the final home of Leonardo da Vinci before he died. Below, the chapel seen from da Vinci's home, and part of the castle itself. 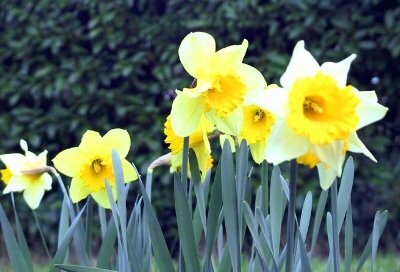 It was a nice sunny day, although the temperatures were only in the mid 40s F.
Ken and I have been deeply touched by the messages of love and sympathy we've received from friends and family since Collette left us on Tuesday. Thanks to all of you who've left comments here and on Ken's site. We appreciate them more than you know. Also, our sincerest thanks for the e-mails and phone calls. 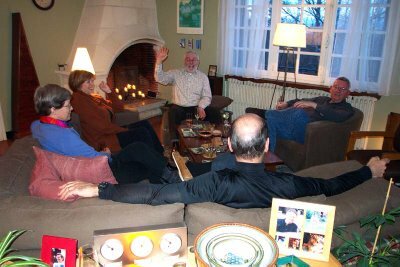 Collette did, indeed, have many friends across the US and here in France. We're glad you're our friends, too! Collette died today. She was 14 years old. She suffered a stroke over the weekend and didn't come out of it. We watched her deteriorate, and made an appointment to have her put to sleep this afternoon, but the shots weren't necessary. She died peacefully as I put her down on the vet's table. We miss her terribly already. She was the best dog, at least as far as we are concerned. 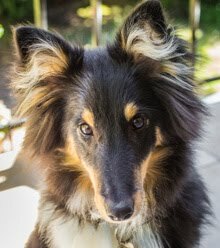 We adopted her at 6 months old in the San Francisco Bay Area. She got to run up and down many California beaches and went camping all over the northern Sierra, in Death Valley, Nevada, and Utah. She knew Yosemite and Joshua Tree, Zion and Bryce Canyon. She saw Washington, DC, Madrid, Spain, and, of course, Paris. She spent a month with us in North Carolina before we all moved to France. Finally, she got to run free in the vineyards behind our house for the last 3 years of her life. We both know she was a happy dog because she made us very happy. Before she left, I promised her that we would guard the house and keep it safe from birdies, squirrels, and kitty cats. Good-bye Collette. L to R: Chris, Janet, David, Tony's back, Ken. Dinner is served (coq au vin, boiled potatoes)! 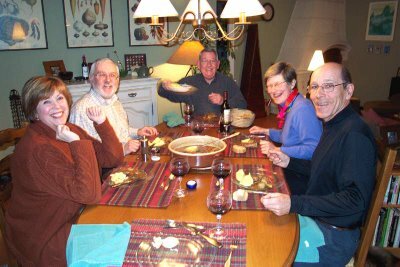 Followed by green salad, cheeses, and two scrumptious desserts that Janet made (a bread pudding and a chocolate fudge-like confection). L to R: Janet, David, Ken, Chris, Tony. We stopped taking pictures as the first course was being served and concentrated on eating. Saturday night, Chris and Tony stayed with Collette while Ken and I went to a Julien Clerc concert in Tours. He did a bunch of old songs and we had a great time, although we didn't think to take the camera. Most people in the theater had their digital cameras out snapping photos the whole time. In 2000, and again in 2001, we rented a small gîte rural (vacation rental) in Vouvray, just outside of Tours. 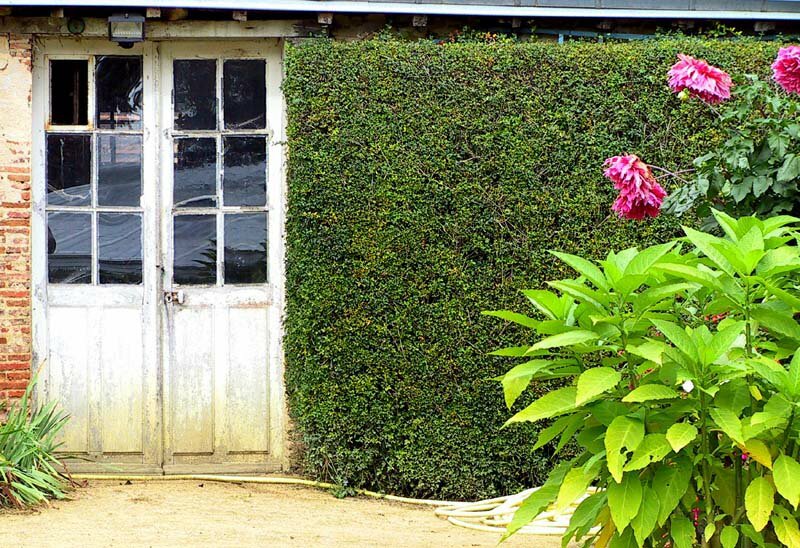 The house was on the edge of a vineyard where they grow the chenin blanc for their famous dry white wine. We had good weather both times and were able to throw all the windows and doors open to take advantage. It was quite pleasant. When we tried to rent it a third time, in 2002, and found it was no longer available. We've been by since and noticed that the house has been renovated and seems to be lived in permanently. Tonight is dinner for 6 at our house. 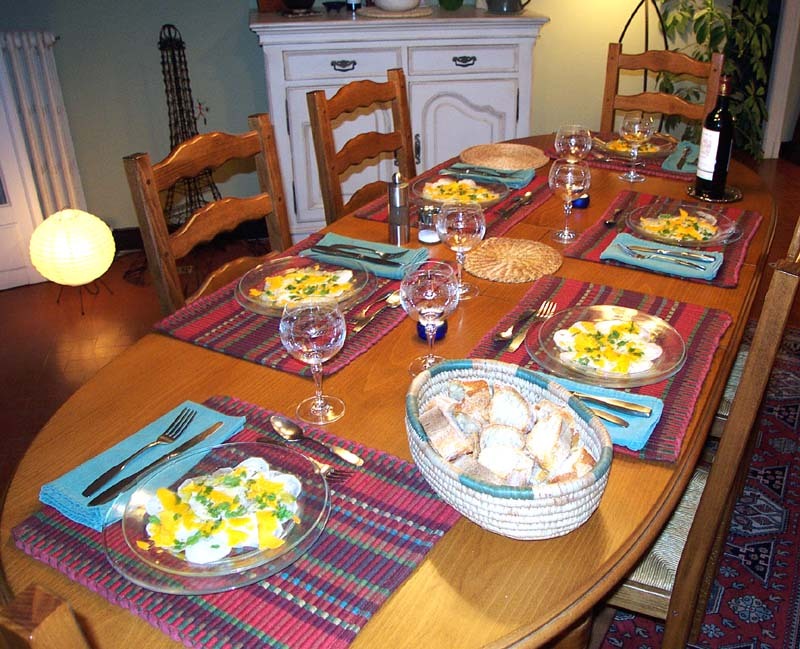 On the menu: sparkling Vouvray aperitifs, thinly sliced black radish with mimolette cheese, vinaigratte and chervil, coq-au-vin with boiled potatoes, green salad, cheeses, and a dessert (being brought by one of our guests). I'm hungry already. The small Château de Bouges is located about 10 kilometers north-east of Levroux. It was built in the mid 18th century and its "claim to fame" is that Tallyrand owned it for a number of years in the early 1800's. On the day we visited, we decided not to take the interior tour but to just wander around the grounds. 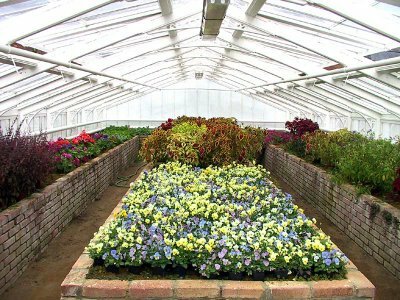 The gardens were beautiful, as were the stable buildings with their collection of saddles and coaches from those early days. 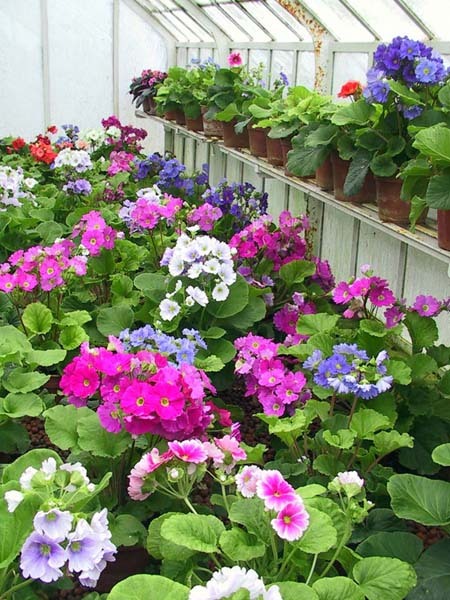 The highlight of the day was the flower garden and its greenhouses. 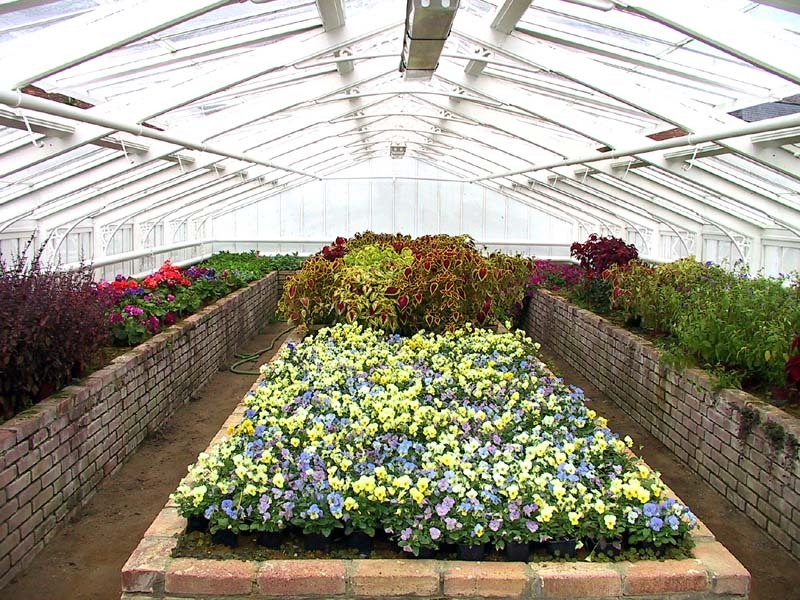 There were at least three greenhouses, all open for us to explore. 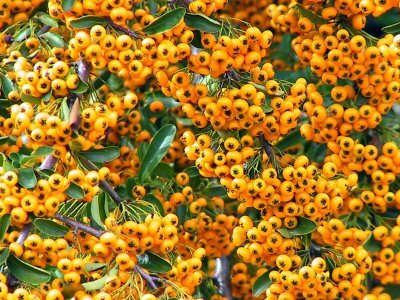 It was early October and we had good weather. Not cold, some sun. 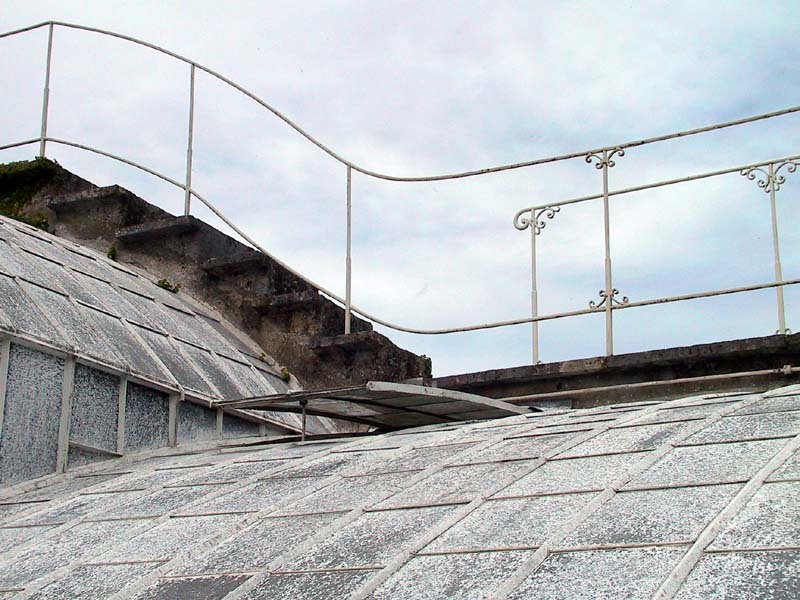 The roof of one of the greenhouses. 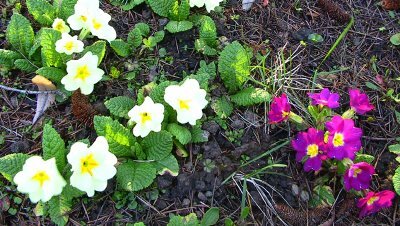 Many varieties of primrose, above and below. Below, a stone face on a wall, seen while wandering the grounds. We spent a couple of hours wandering around. Toward the end of our visit, we noticed that there were more people in the courtyard than there had been when we arrived. 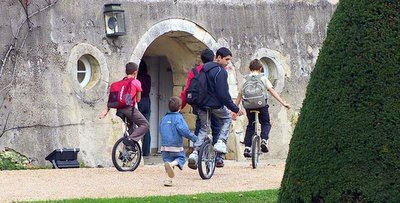 It turned out that on this particular day there was some kind of children's event at the château. We poked our heads in and helped ourselves to some of the light refreshments that were put out for the participants - touring châteaux is thirsty work. All of a sudden, some boys on unicycles raced by (above). I have no idea how they got in with their "wheels," but there they were. We headed home after that and settled in with a bottle of sparkling Vouvray. It was a very nice day. Yesterday's snow made me feel pangs for spring. 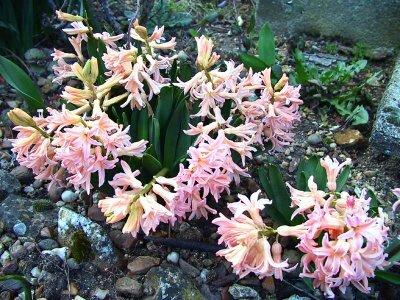 The snow is melting now, and that's good, but I still long for the warmer temperatures and flowers of spring. Here's an image of a warmer time. It's from Vouvray, when we were there on vacation in June of 2001. Thanks to all of you who've mapped yourselves! I really appreciate your having made the effort. 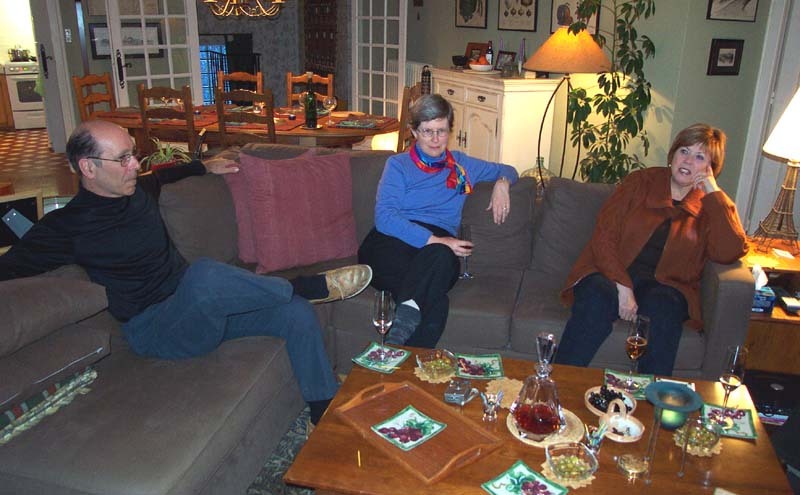 Most recently, Barbara Moss in Chicago, Tom and Harriet in Sidney, Mimi in Boston, and Franck in Lille, mille mercis. Remember, to see the photos of those of you who have mapped yourselves, click on "wcs blog" on the top part of the map itself. Frappr will take you there. Enjoy! You may have noticed over in the margin on the right that I've removed the link to my old website. I haven't updated that site in a long time and I don't intend to now that I'm here on Blogger. At some point soon I will likely recycle some of that material here. In other news, we woke up to a wintry wonderland this morning. It's still snowing about 3 hours later. Ken's done a fine job of documenting it here. Take a look! Collette got to go outside for necessary stuff, but no walk this morning. She just got groomed yesterday. She's napping on her the couch, nice and warm, nice and dry, nice and clean. UPDATE (4 March, 3:15 pm): Still snowing - hasn't stopped. I think we have about 5 inches on the ground so far. The two most prominent landmarks in the 7th Arrondissement: the Eiffel Tower and the gilded dome of Invalides, along with the large open space parks around them, are high points of this tour. 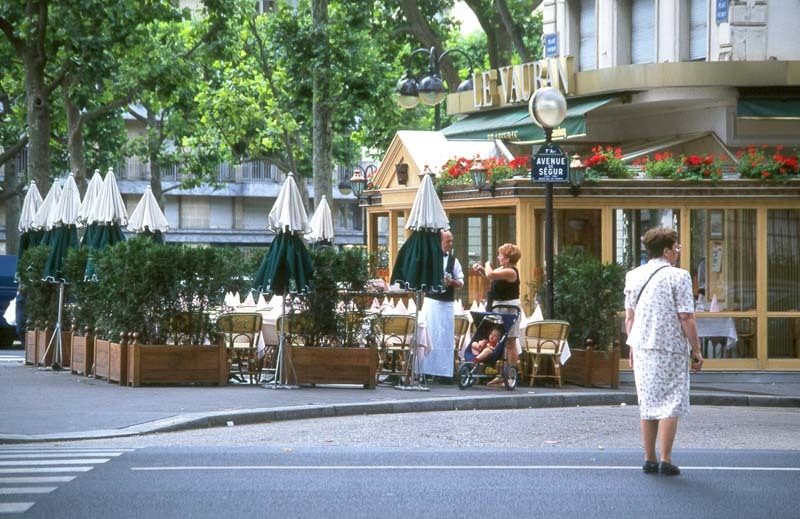 Paris’ Seventh Arrondissement is one of the “newer” neighborhoods in the city. By that, I mean that it was an area outside the defensive walls of the historical city. 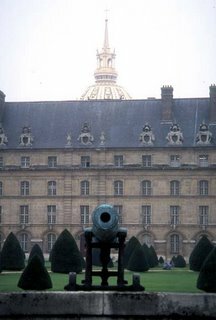 Late in the 17th century, Louis XIV began construction of the veterans’ home, Les Invalides, on the plain of Grenelle outside the city. Much later, through the 18th and 19th centuries, the area filled in. Today, it is a chic residential quarter chock full of landmarks and monuments. This tour is, in a way, peculiar since it is a walk backward in time. We’ll start with the Eiffel Tower itself, one of the newest landmarks in the area, and progress backward in time to one of the oldest: the Hôtel des Invalides. 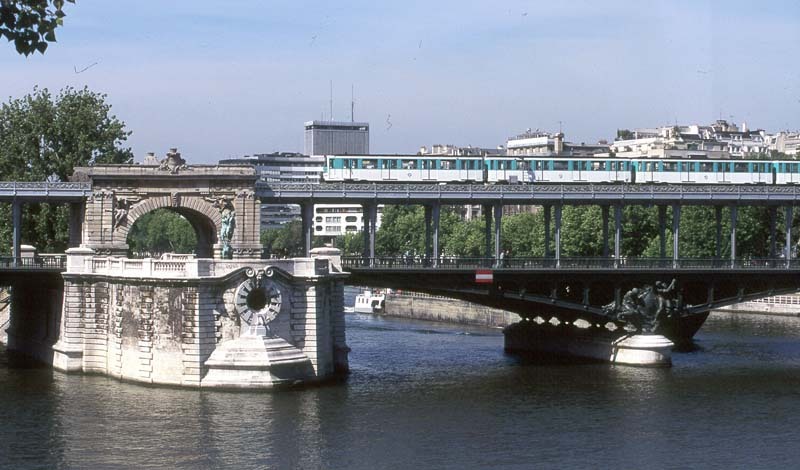 Métro line number 6 crosses the Seine on the Bir-Hakeim bridge close to the Eiffel Tower. Begin your tour at the Bir Hakeim métro station. 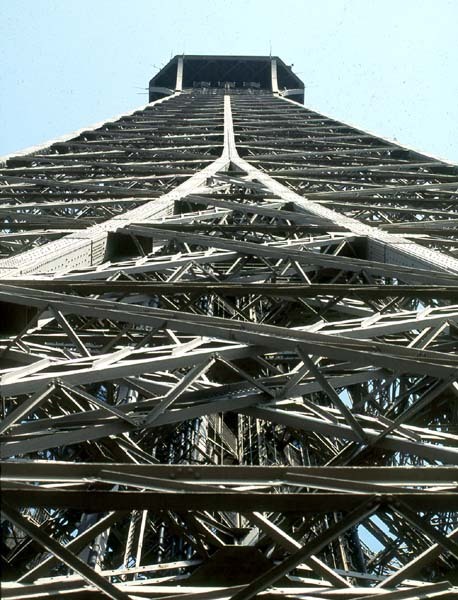 Walk upriver, along the Quai Branly toward the Eiffel Tower, and make your way to the space directly under the tower. 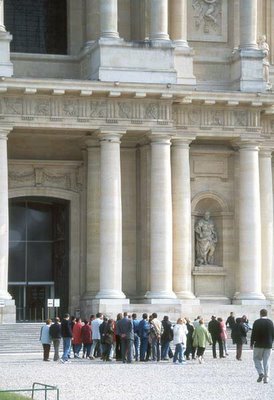 This is, of course, one of the most visited sites in Paris and you will undoubtedly be part of a crowd. 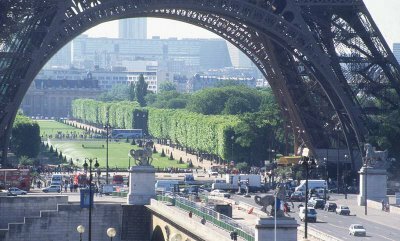 The base of the Eiffel Tower and the Champ de Mars beyond. 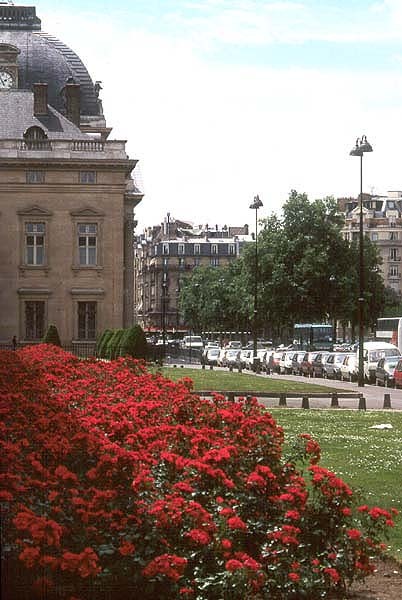 With your back to the river, look south-east toward the Ecole Militaire. 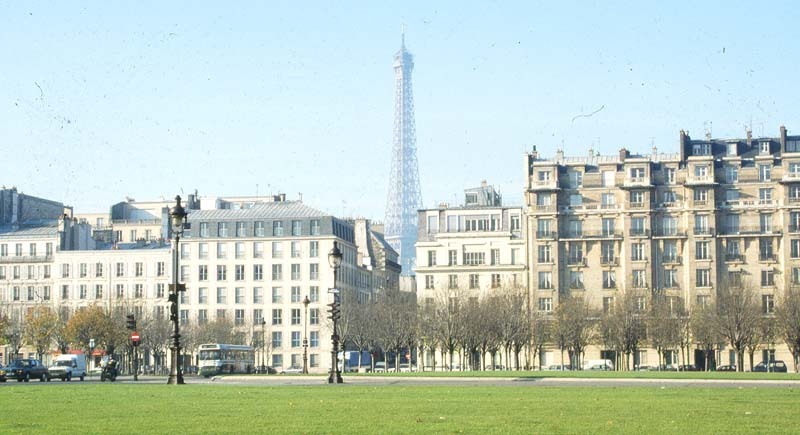 What you are seeing is known today as the Champ de Mars. 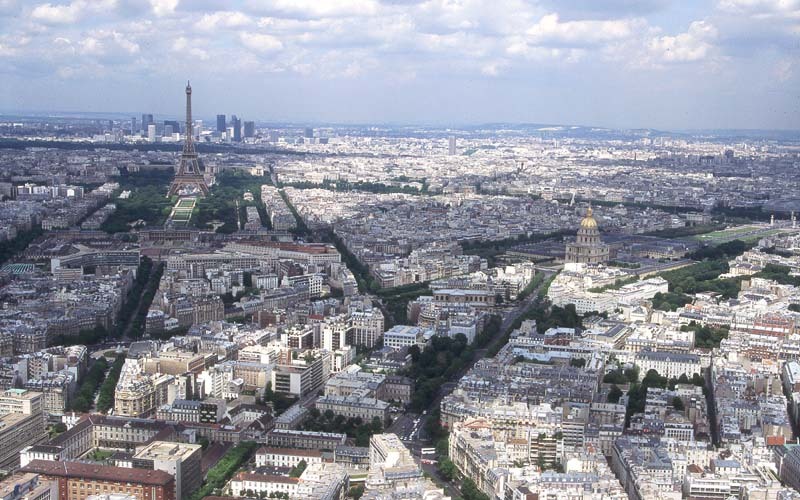 But as late as the 17th century, this was the center of a vast, empty space known as the plain of Grenelle. The plain stretched from what is now the Blvd. des Invalides to the Blvd. de Grenelle and beyond. 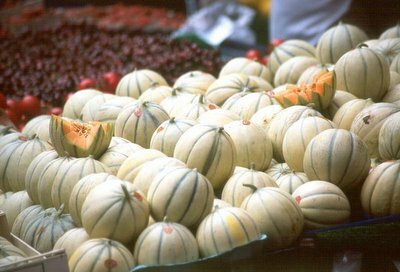 This land was part of the holdings of two Paris abbeys: St.-Germain-des-Prés and Ste.-Geneviève, and was a place where people hunted rabbit and quail, or, closer to the river, grew vegetables for sale in the city’s markets. The land nearest the river was marshy, with islands that were later incorporated into the left bank. 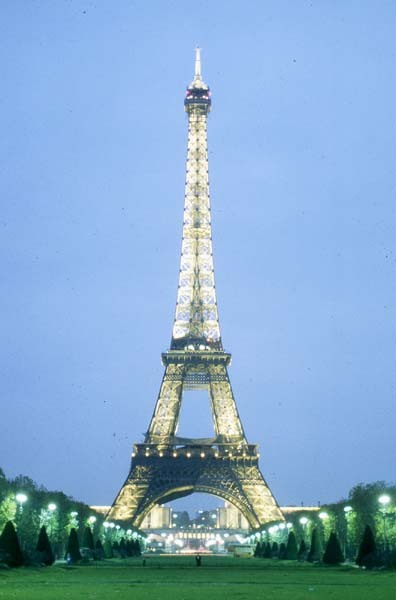 The Eiffel Tower itself is described in great detail in nearly every Paris guidebook. 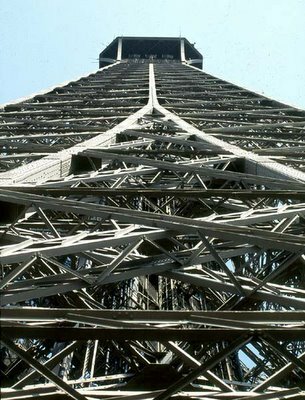 Suffice it to say that it was constructed as part of the Paris Universal Exhibition held in 1889, on the centennial of the French Revolution. Intended as a temporary show of construction technology, the tower has become a permanent fixture on the skyline and in the tourist itineraries and is well worth waiting in the long lines to visit. 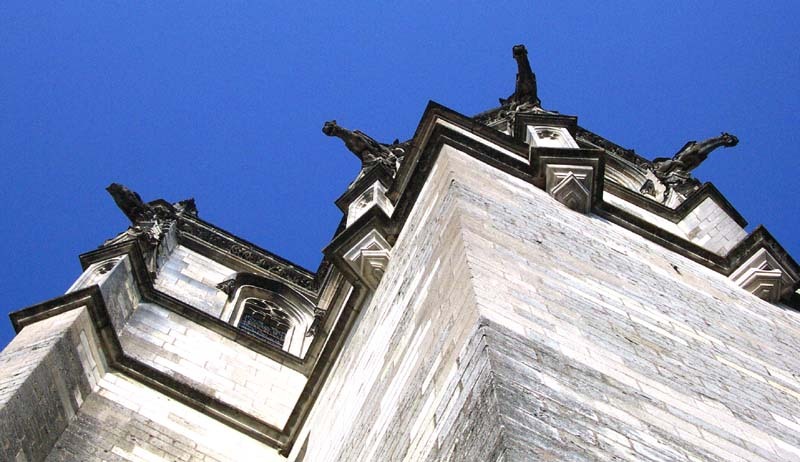 Above, the tower's intricate structure. 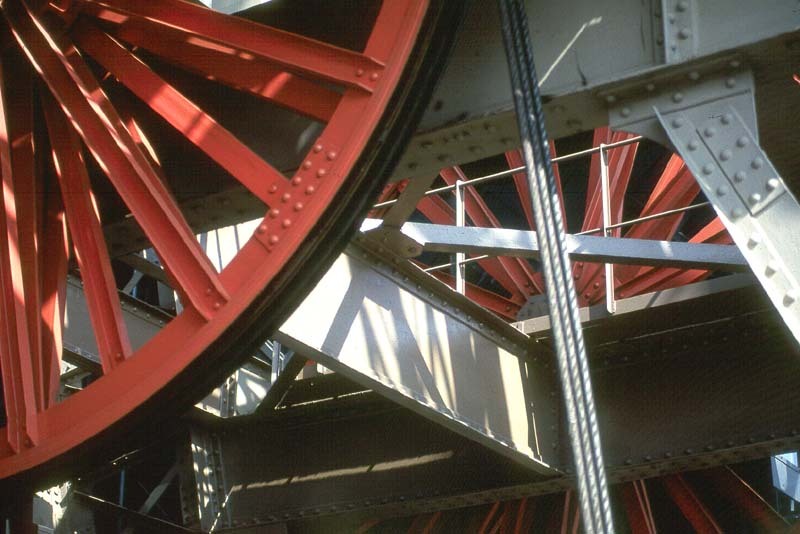 Below, some of the machinery that powers the elevators that move visitors up and down inside the Eiffel Tower. 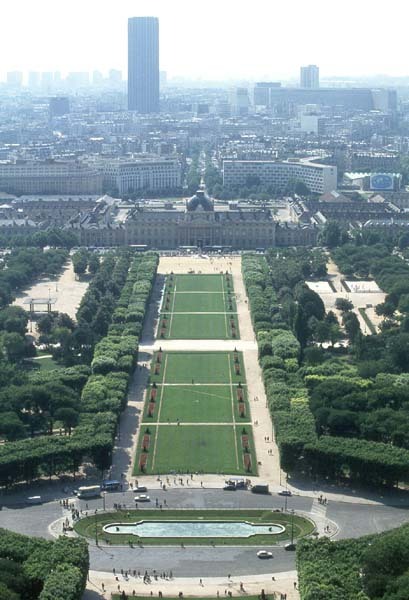 What many guidebooks only touch on is the historical use of the Champ de Mars. When the Ecole Militaire was constructed between 1751 and 1773, the land between it and the Seine was converted to a parade ground for military exercises. 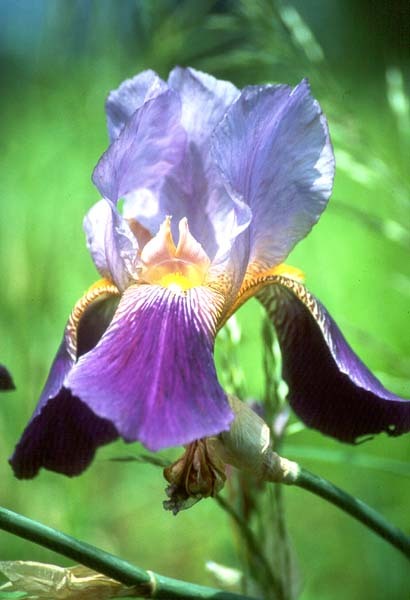 After 1780, the land was opened to up to the public. 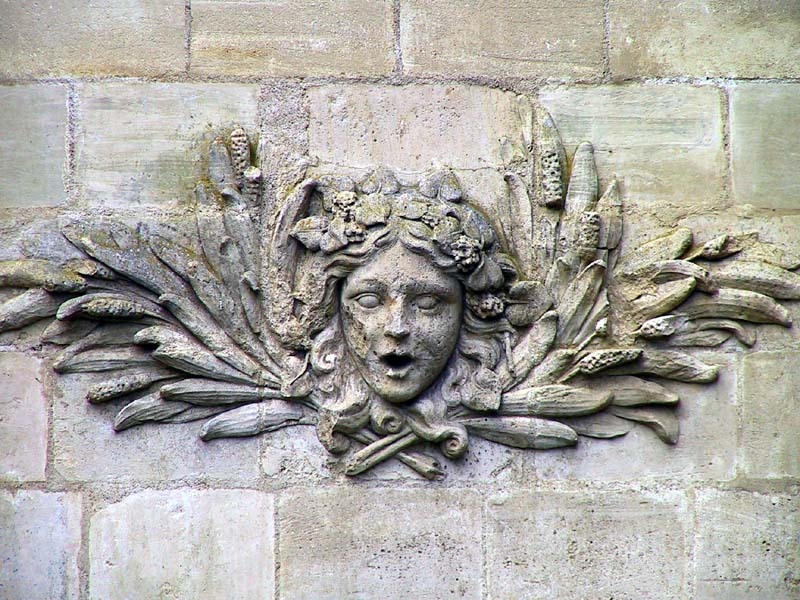 In 1790, the Federation celebration was held here to mark the first anniversary of the storming of the Bastille. 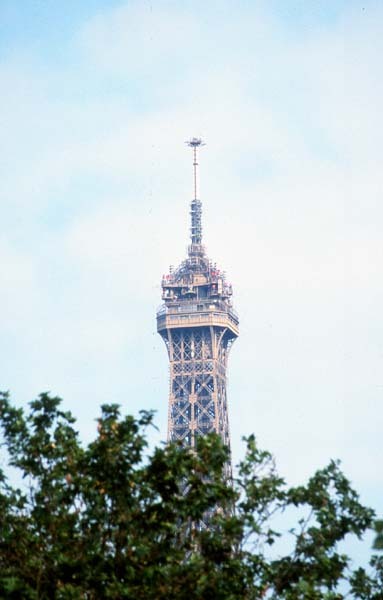 Since then, the Champ de Mars has been used for countless celebrations and fairs, including the Universal Expositions of 1867, 1878, 1889, 1900, and 1937. A walk on the Champ de Mars. Walk from the Eiffel Tower across the Champ de Mars toward the Ecole Militaire (in this photo: the Champ de Mars with the Ecole Militaire in the center; behind it and to the right is the UNESCO headquarters building). 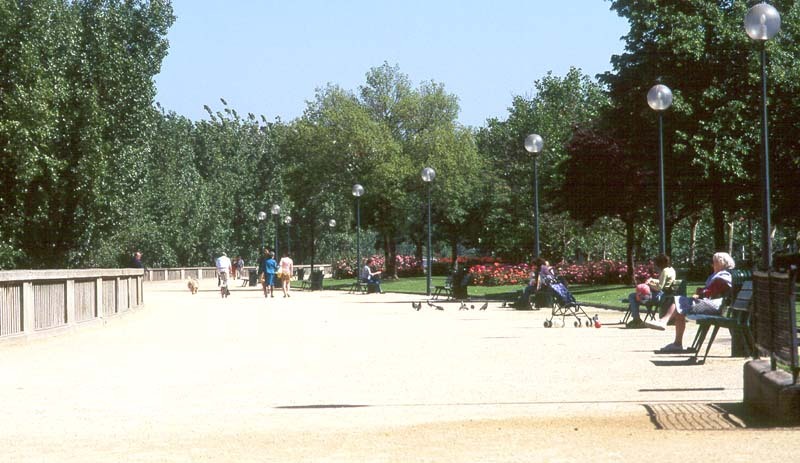 You will notice that the vast park is thoroughly used and enjoyed by tourists and residents alike. When you reach the Ecole Militaire, turn right on the Avenue de la Motte Picquet, then left on the Avenue de Suffren. At the southern corner of the Ecole Militaire, turn left onto the Avenue Lowendal. Across the avenue is the headquarters of UNESCO (United Nations Educational, Scientific and Cultural Organization). The building was completed in 1958 and is the result of collaboration between American, Italian, and French architects (Breuer, Nervi, and Zehrfuss, respectively). The modern building is home to several works of modern art by Picasso, Moore, and others. Above: the Ecole Militaire. 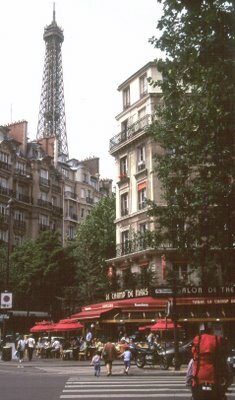 Below: the Eiffel Tower looms over a neighborhood café. 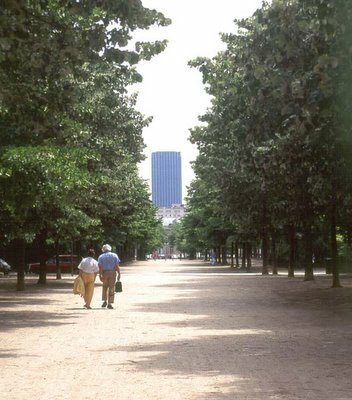 Continue along the Avenue Lowendal, cross the Avenue Duquesne, and proceed to the Avenue de Tourville. Turn right and walk to the semi-circular Place Vauban. 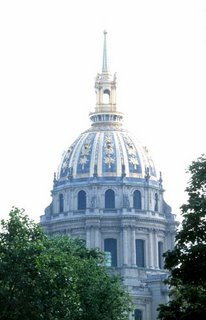 By now you have noticed one of the more prominent landmarks of the quarter, the Church of the Dôme at the Hôtel des Invalides. 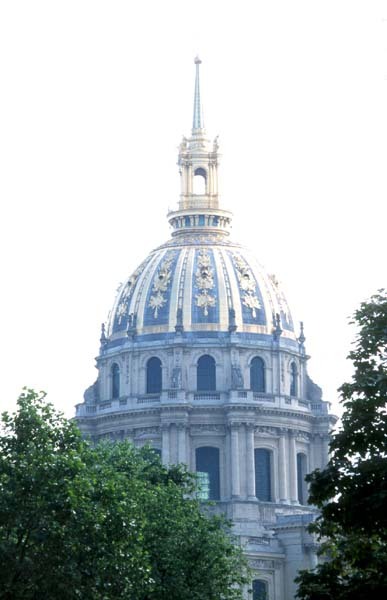 The gilded dome (re-gilt for the bicentennial of the French Revolution in 1989) glistens in the sun and marks the final resting place of the emperor Napoléon Bonaparte. 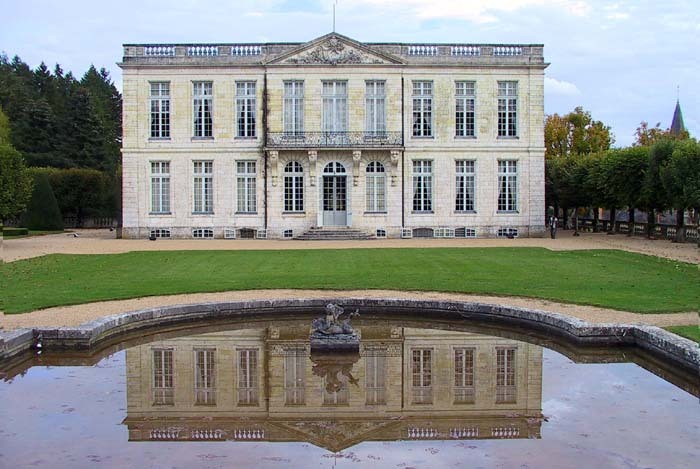 The elegant Place Vauban. Above: a residential building. Below: getting ready for lunch at Le Vauban. 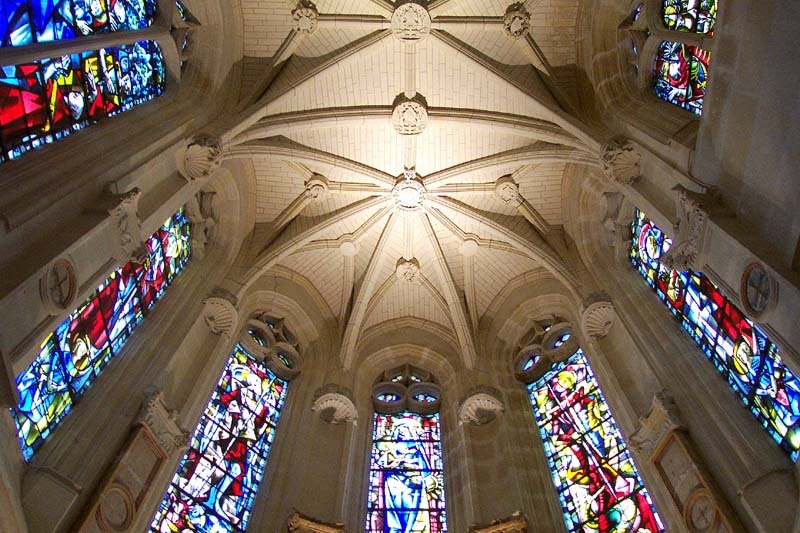 The vast complex that surrounds the church is worthy of an extended visit. In addition to Napoléon’s tomb in the Church of the Dôme (seen at right), you will find another church (Eglise St. Louis), the national Army Museum that chronicles military history, uniforms, arms and other equipment and a fascinating collection of model forts, fortified cities and towns, and significant battlefields (Musée des Plans Relief) that spans three centuries. A tour group gathers to enter the Church of the Dome. 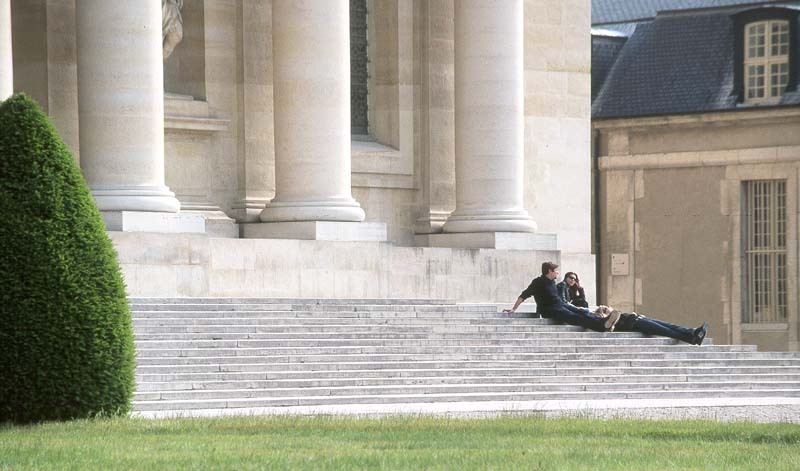 Relaxing on the steps in front of the Church of the Dome. 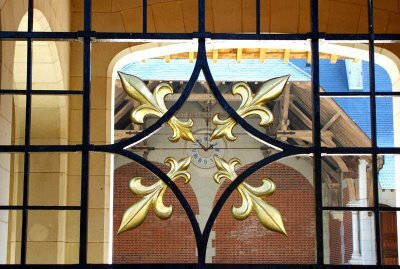 The complex was begun under Louis XIV in 1670. Its purpose was to house veterans of war that were injured in service to the king (les invalides). Near its completion, it welcomed nearly 4,000 veterans. The place was pillaged during the revolution in 1789, mostly for the weapons that were stored in the basements. 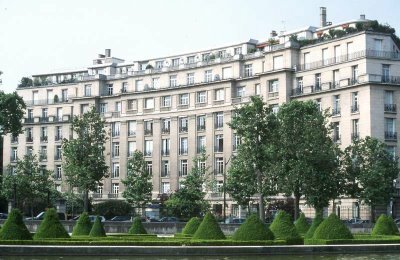 From the Place Vauban, continue along the Avenue de Tourville to the Boulevard des Invalides and turn left. Turn right into the rue de Varenne. Here is the entrance to the Hôtel Biron, home to the Rodin Museum. 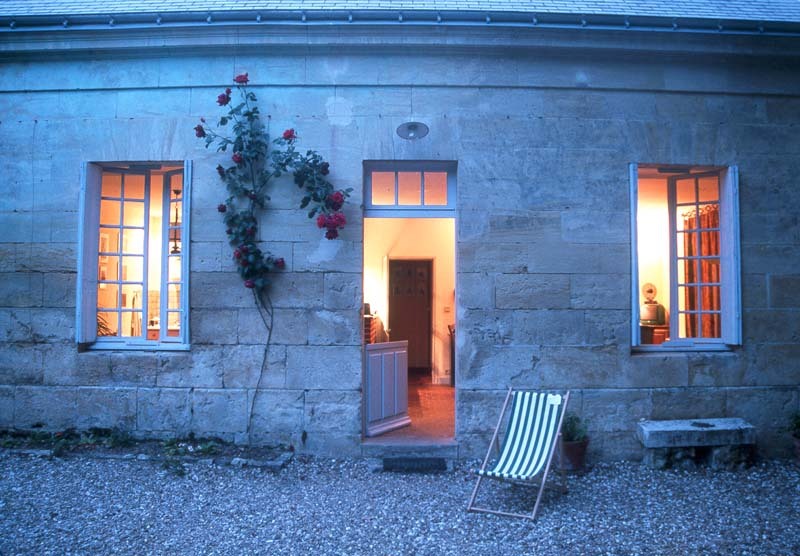 Auguste Rodin left his work to France in exchange for a place to live and work in this 18th century mansion. The gardens around the house make for an enjoyable stroll and serve as a striking setting for many of Rodin’s famous sculptures. Inside the building are many more of Rodin’s works. There is an admission fee for both the garden and the building. 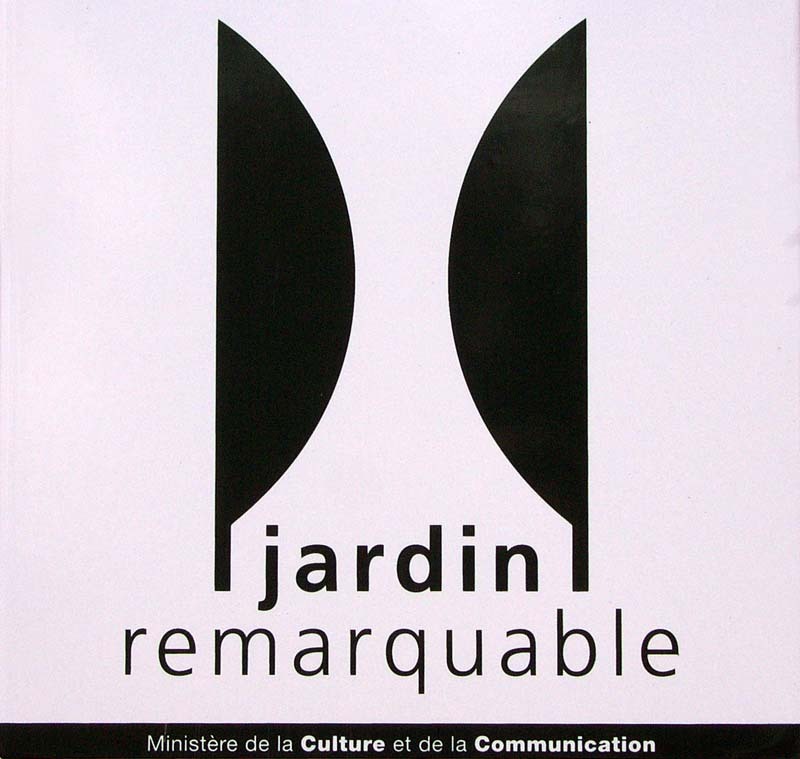 The gardens and the Rodin Museum. If you enlarge the photo (click on it), you can make out the famous statue Le Penseur (The Thinker) in the garden just to the left of the house. 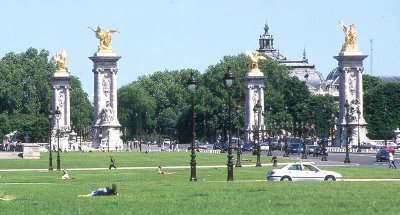 Return to the Boulevard des Invalides and continue around the the Hôtel des Invalides to the vast grassy area between it and the Seine. 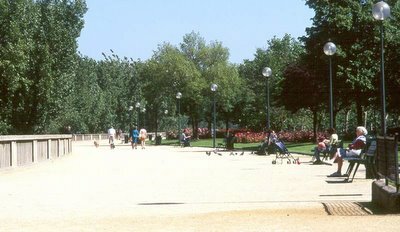 The Esplanade is bisected by the Avenue du Maréchal Galliéni, which connects the Invalides to the Pont Alexandre III. Walk about halfway toward the Seine (notice the glass roof of the Grand Palais on the right bank) and turn left on the rue Saint Dominique. Walk back toward the Eiffel Tower along the rue Saint Dominique into the heart of the residential portion of the 7th Arrondissement. 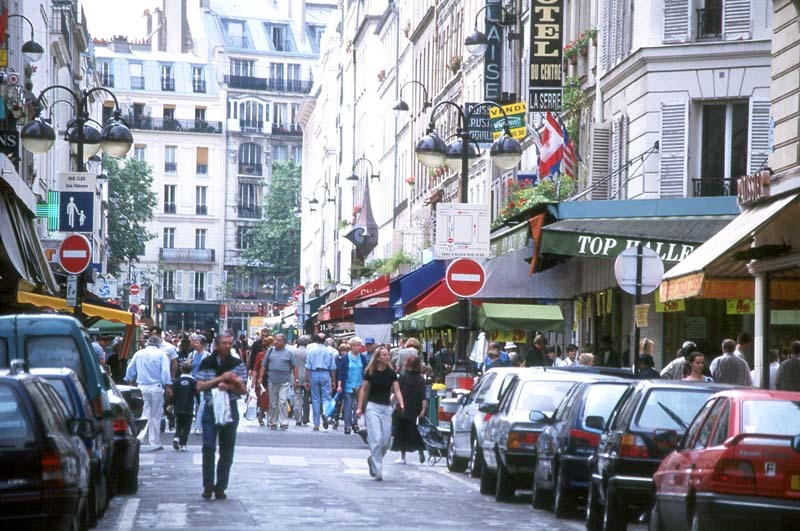 On this street and those surrounding it you will find numerous shops, boutiques and restaurants. 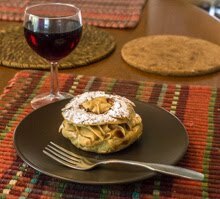 Some are well known, like the Restaurant Thoumieux or the shop of famed baker Jean-Luc Poujauran (on the rue Jean Nicot). The Invalides seen from the Alexander III Bridge. 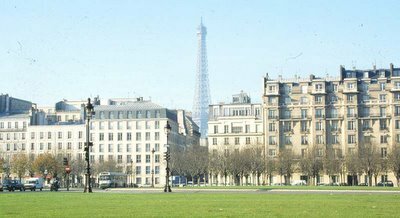 The Eiffel Tower seen from the grassy Esplanade des Invalides. Lying in the grassy Esplanade. 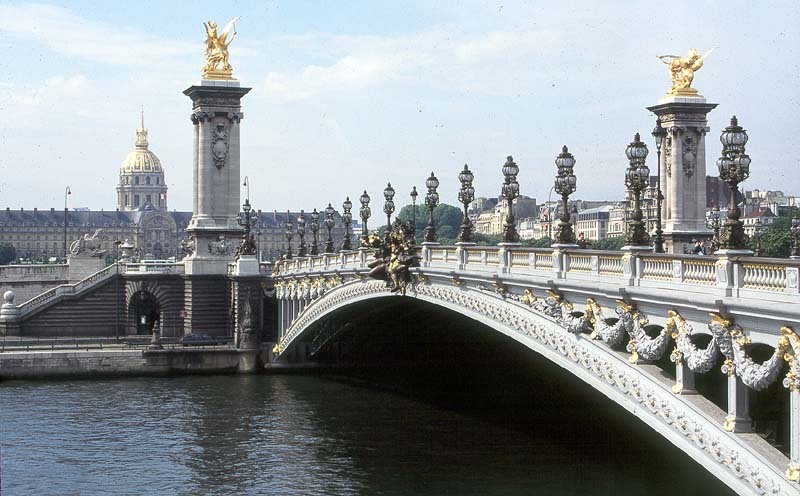 The columns of the Alexander III Bridge rise up to mark the Seine River. Continue on the rue Saint Dominique to the rue Cler, and turn left. 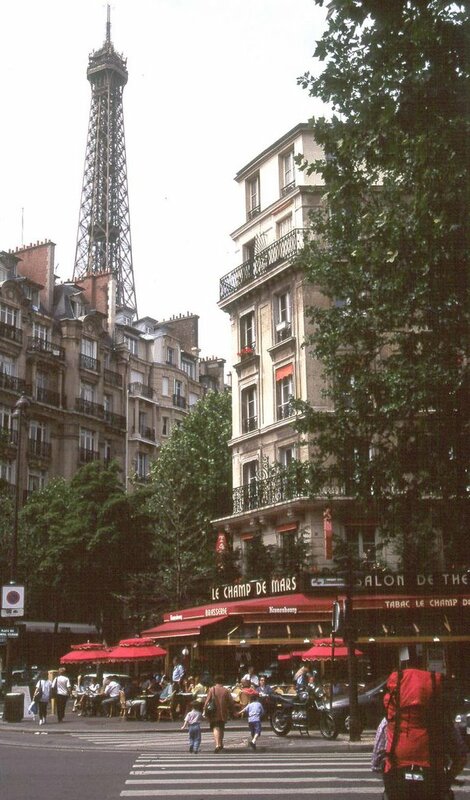 For many Americans, the rue Cler was made famous by travel writer Rick Steves. 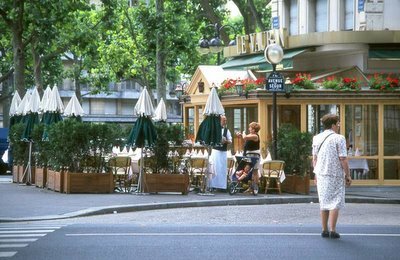 This is one of the many market streets in Paris, lined with bakeries, cheese shops, vegetable stands, wine shops, butchers, delis, purveyors of table linens and kitchen tools, cafés, and newsstands. Every day is market day on the rue Cler, and Parisians living in the surrounding upper middle class neighborhoods come here daily to buy food. Now, of course, so do many tourists, and the cafés and shops are showing signs of catering to them as much as to locals. 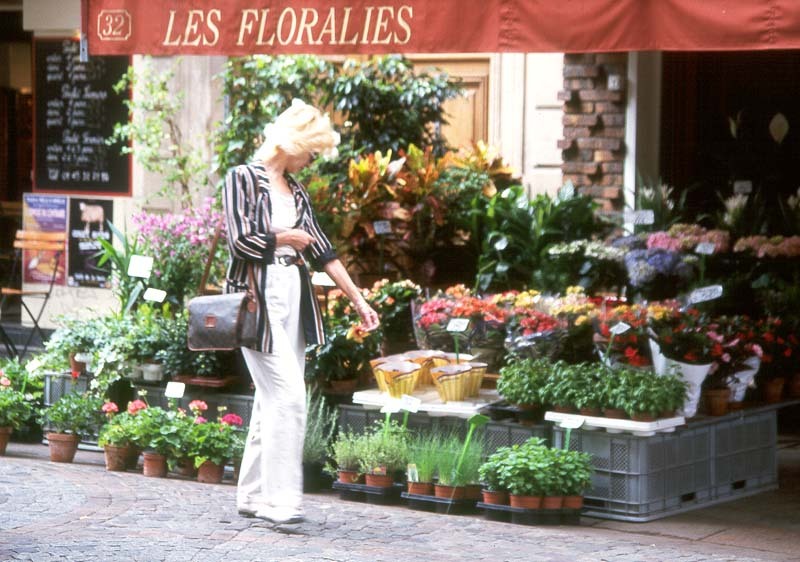 But the rue Cler is still a pleasant walk and one of many ways to see how Parisians shop. Stop here for a drink, or a bite to eat. 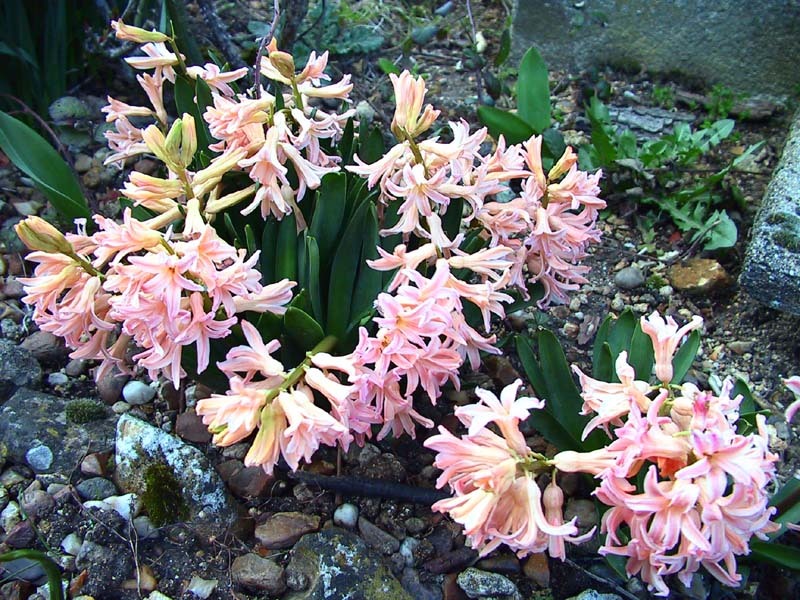 Below, images from the rue Cler. 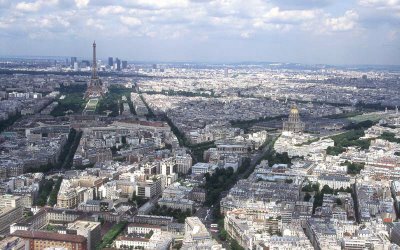 From the rue Cler, you can head in any direction, back to the Eiffel Tower, over to the Seine for a walk along the river, or farther afield to the right bank or into the solidly residential neighborhoods of the 15th Arrondissement. Strolling along the Seine on the left bank. This is the final tour in my little series. I hope you enjoyed them. I'd appreciate any comments you have! Thanks.